I started App-o-Mat as an iOS tutorial site back when I was consulting. It mostly had cordova screencasts. I’m going to be doing more writing about iOS there (native and possibly cordova-based). You can subscribe to the mailing list there if you want to get updates. If you have requests for topics to write about, let me know. How do I pass values from a VC back to the VC that presented it? Ok, so you have a view controller that brings up another view controller. Let’s call the first one FirstVC and the second one SecondVC. FirstVC either presents SecondVC or there is some segue that it uses to bring it up. How do you keep Storyboards from causing merge problems later? There’s this myth in the iOS community that “professional” iOS developers never use Interface Builder. It’s meant to imply that coding your interfaces is always better, and if you don’t do it, you are somehow less of a programmer. The myth perpetuates the idea that IB is a crutch, a toy, something that only newbies use. How do you pass values to a VC in a segue? A theme I see a lot on StackOverflow is a developer makes a View Controller that collects some information from a user and wants to use it on a VC that they bring up in a segue. This entry was posted in iPad, iPhone, Software Development on 2017-Aug-25 by loufranco. I imagine a lot of the information here is going to go out of date fast, but if you are looking at playground books today, here is where to start. The WWDC 2016 talk, Introducing Swift Playgrounds, has a lot of technical detail about the .playgroundbook format and how the LiveView proxying works. The demo for that talk is available on Apple’s dev site, but it’s out of date. I’ve been updating it for each iOS 10 Beta (to track Swift 3). Go to my GitHub to get the fixed Talking to the Live View sample. The documentation for the .playgroundbook format can be found on the Apple Developer site. Erica Sadun, who has written the book on Xcode playgrounds did some early investigations of iOS Swift Playgrounds. You might want to read them — here is Part I, Part II, Part III, Part IV, and Part V.
Ash Furrow made a playground book linter and authoring tool (source). You can use the linter on any .playgroundbook (however you make it), and the authoring tool allows you to specify the parts of the book in a .yaml file, and it puts each piece in the correct file and folder for you in the .playgroundbook package. This entry was posted in iPad, Software Development, Swift Playground Books on 2016-Sep-02 by loufranco. This weekend I finally finished v3.0 and made it free. As this is a developer site, the more interesting thing to note is that Habits was originally made in the first iPhone supporting version of Xcode (with external Interface Builder) and I have been migrating the project file from version to version since then (using 7.3.1 to make the current build). Accessibility – Since NSSpain 2015, I’ve been running my iPhone with triple-Home to get into VoiceOver (suggested by Hermes Pique in this talk). Doing that made me realize (1) what it was like to use Habits without looking at it (2) how easy it was to make it work properly. Carthage – there had never been 3rd party libraries in Habits, but I decided that one was worth it this time. TOCropViewController – A simple framework that does one thing very well – provide a View Controller for cropping images. I use this instead of the built-in iOS one because it supports locked aspect-ratios. 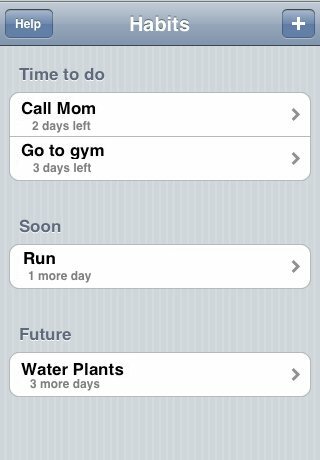 This entry was posted in Habits, iPhone, Software Development on 2016-Jul-12 by loufranco. My app developing habit … is get a new passing unit test every day. […] that new green dot is my indication that I’ve at least added a little bit to the application. This is a habit I started in earnest when I took B. J. Fogg’s Tiny Habits course. My tiny habit was to just run the simulator, and the best way I found of doing that was to run the tests through it. Then, writing a new test for whatever functionality I was planning next just seemed to be the perfect way to extend it. Once I write that first test, I don’t TDD the rest of the way, but I’ve found that first test to be a good way to warm up. This entry was posted in Habits, Software Development on 2014-Jan-09 by loufranco. You can have both versions of Xcode on a machine simultaneously. I downloaded the iPhone/iPad iOS 7.0.2 ipsw’s from the developer website and loaded them into the 4.6.3 Organizer (Devices -> Library -> Software Images). One annoyance is that both versions share Recent Projects and will automatically open projects that are open in the other one. It’s usually best to only start one if the other is closed or doesn’t have any projects open. I also read on StackOverflow that you can get Xcode 5 to create iOS6 apps by making a symbolic link from inside the Xcode 4.6.x app bundle to inside the Xcode 5 app bundle. This entry was posted in Software Development on 2013-Oct-08 by loufranco. Habits 2.02 should be ready in a week with these lessons applied. This entry was posted in Software Development on 2013-Aug-26 by loufranco. If you want to show off the power of your programming language, nothing works better than a cool one-liner (or even better, a code tweet). I have to program in a few different languages, of varying degrees of power, and one thing you start to notice is the 0-liners — the code that just doesn’t exist. In Objective-C, nil sinks messages. This means that in a lot of cases, you don’t have to check for nil and “the right thing” happens automatically. If you send nil a message, it’s a no-op, and if you need a return, you get 0 for scalars, nil for objects, 0-filled structs, and undefined for anything else. You still consider the nil case, but you usually don’t need to write any code. This is a real example of a language completely implementing a design-pattern, in this case Null-Object. You can get similar behavior by using this pattern. Clojure does even better by letting you implement a protocol on nil to provide implementations for its functions called with nil. But, neither of those are 0-liners. I don’t use F# (or Scala), but my understanding is that when Some/None discriminated unions are used in computation expressions, the computation will end and return None if some part of the expression returns None. This is a classic 0-liner, if I’m right. async in C#/F# (and go blocks in clojure’s core.async and go) rewrite sequential looking code to actually be asynchronous with callbacks. Miguel de Icaza covered this recently in his post, Callbacks as our Generation’s Go To Statement. Just like in the Go To days, or the days of manual memory management, we are turning into glorified accountants. Check every code path for the proper state to be properly reset, updated, disposed, released. In this case, only go and clojure are true 0-liners, as you still need the await keyword in C# (and let! etc in F#) to indicate a blocking call. clojure’s BigInt contagiousness turns your overflow checks into 0-liners. If this is a possibility in your integer algorithms, it’s worse than null checks. What’s your favorite 0-liner? The nice thing about them is that they don’t use up any of your 140 characters in a tweet. This entry was posted in Software Development on 2013-Aug-21 by loufranco.